TEXAS CITY, Texas—The school district here uses a facial recognition system to scan for people not allowed on school grounds. IDs track the whereabouts of students and staff. Teachers have cellphone panic buttons to alert police and soon will have special locks on classroom doors that can be activated remotely. A newly expanded security team keeps 22 AR-15 rifles in their offices. The district has spent $6.3 million in eight months on these and other security measures to keep students safe from potential shooters. I've been to Texas City in the past & this relatively affluent Gulf town never struck me as the kind of place that would require this kind of draconian school security. I think that most of this money might better be spent upgrading the quality of the education provided to the students. Last edited by JacksinPA; 02-03-19 at 12:37 PM. I've been to Texas City in the past & this relatively affluent Gulf town never struck me as the kind of place that would require this kind of draconian school security. I think that money might best be spent upgrading the quality of the education provided to the students. That place in Florida was pretty affluent, too. Twenty-two AR-15 rifles? Sounds like overkill out of which some security consultants made a lot of $$$. At least, from what I read, they are not proposing to arm the teachers. But this is TX where things are supposed to be bigger than life. Last edited by JacksinPA; 02-03-19 at 12:44 PM. Going by what you have posted the only part I might have objection to is the tracking of the whereabouts of students. I'd need more details to be sure though. What's wrong with the rest that makes it so draconian? I've been to Texas City in the past & this relatively affluent Gulf town never struck me as the kind of place that would require this kind of draconian school security. I do not know anything about Texas City, but I do know that "draconian school security" is badly needed in many large city schools in order to protect teachers and students from fellow students who constantly cause trouble. Outside bad actors are only a secondary concern in many cases. 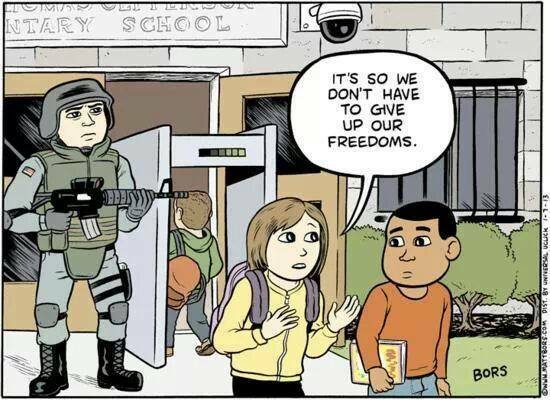 Personally, I wish there were "draconian security" in every level of American society. There is no excuse for anyone to be the victim of physical violence. Unlike celebrities (and politicians) the ordinary person does not have a bodyguard. Twenty-two AR-15s? That's enough firepower to equip an infantry patrol in the 'Nam. It looks like overkill to me. Two or five perhaps, but 22? Meh, amount of guns is irrelevant to me. Are the people that are going to use them skilled enough with them is my main concern. In any case, how big is this school? That may explain the amount. It's also possible that there will be patrol shifts that require the additional guns so that while one shift is out patrolling the other can gear up. I really don't know. Need more information. You should move to Russia. You'd feel a lot safer & at home there. Most small to medium-sized cities don't have - or need - that kind of firepower unless they are preparing for an armed insurrection among the students. But I'll bet they have metal detectors for weeding out the kids who come to school 'heavy'.